-MATHEMATICS - 1 for each semester -a set of full-color workbooks for learning Math entitled: Focus on Math by Harcourt. 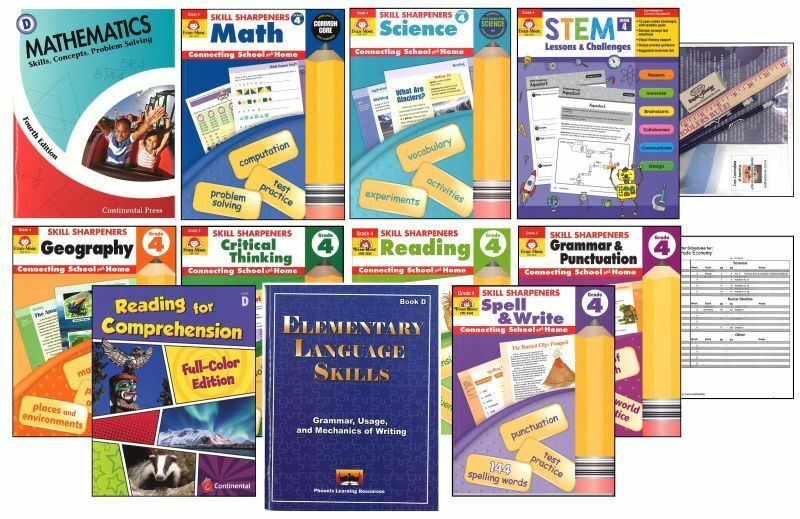 6 full color workbooks covering all the subtopics of mathematics from problem solving to measurement to word problems, fractions, ratio and more! Answers are included. And - Math Concepts and Problem Solving. Student Workbook. Answers are included. -SOCIAL STUDIES / HISTORY: A full-color workbook entitled; 'Regions of Our Country', by Houghton Mifflin/Harcourt. Answers included. -And... a set of full color worksheets on the subject of: 'Presidents' - Skills for Scholars series. Includes Answers. ENGLISH GRAMMAR utilizes a 2-color workbook concentrating your child's learning on the elementary skills of language. This workbook covers all forms of grade-level Grammar, Usage and Mechanics. Includes: Answer Key. SPELLING & WRITING - A full-color workbook to master the skills of Spelling and Writing at this level - Spell & Write This is a bright, colorful, workbook by Evan Moor Publishing. Answers Included. READING - Reading Skill Sharpeners - A very nice full-color workbook by Evan Moor Publishing. Answers Included. -READING - 3 book set of workbooks - Full Color - from Novice - Advanced levels. Reading enjoyment is nurtured through high-interest content. Answers Included. -ALSO: a Full-Year suggested schedule for the core courses! Basic bundles contain the bare minimum materials to meet Federal/State requirements. Parent/teachers should understand that students need to have additional and supplemental activities added to his/her school day for better understanding and final mastery of the topic(s) presented.